New data from the Department of Education and Training (DET) provides an interesting snapshot of the offshore delivery of Australian higher education. The DET report sets out some 2015 and 2016 benchmarks for foreign student participation in what is most often called transnational education (TNE) – that is, enrolment in Australian higher education programmes delivered outside of Australia. But it does so in part by relating those student numbers to onshore enrolment (i.e., foreign student numbers within Australia) to provide a more comprehensive view of foreign student participation in Australian higher education. Taking these different modes of onshore and offshore delivery into account, DET calculates that there were just under 400,000 foreign students (391,136) enrolled in Australian higher education in 2016. Nearly a third of that total, or just about 112,500 students, were enrolled offshore with the balance studying on campus in Australia. Overall, the volume of offshore enrolments grew by nearly 3% between 2015 and 2016. This compares to just under 10% growth in onshore student numbers in Australian higher education over the same period, and the nearly 11% growth in total international enrolment within Australia for 2016. The DET numbers also provide an important reference point for some of the very ambitious goals set out in Australia’s National Strategy for International Education 2025. The national strategy was released in 2016 and it imagines very dramatic growth in Australian TNE through 2025, and across all modes of delivery. One of the pillars of the Australian strategy is an allied national plan called the Australian International Education 2025 (AIE2025) market development roadmap. It imagines a high-level target whereby Australia might earn a 10% share of what the AIE2025 analysts calculated to be a one-billion-student market for TNE learning. The new DET numbers, meanwhile, put some detail to the 2016 baseline for enrolment in Australian TNE. The department tracks student numbers across three modes of delivery: those studying at Australian branch campuses abroad, those enrolled in programmes delivered in partnership between Australian and foreign institutions, and those following Australian higher education programmes online. The 2015 and 2016 numbers for each delivery mode are summarised in the following table. 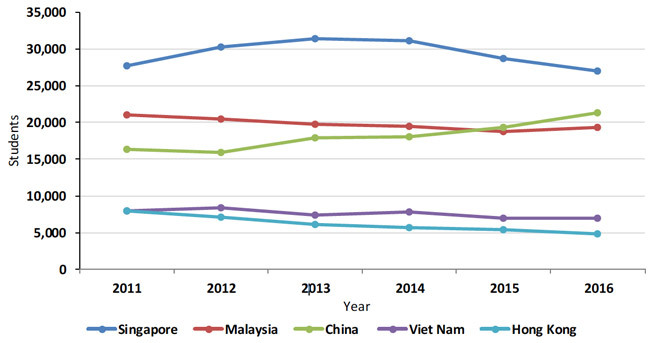 As the table illustrates, there was a slight decline in the total enrolment at the 14 international branch campuses operated by Australian institutions in 2016. Student numbers in joint programmes abroad showed steadier growth at just over 5% whereas online enrolment grew 3% year-over-year. 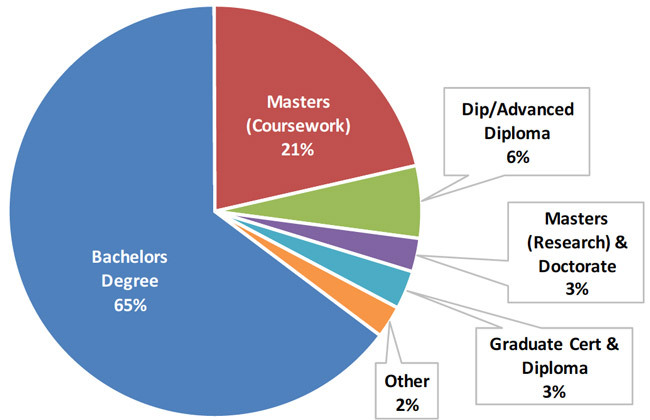 DET highlights as well that nearly two-thirds (65%) of offshore students are enrolled in bachelor degree programmes, with another 21% following masters-level courses. More than six in ten (62%) were enrolled in business studies, and 16% in engineering, information technology, or other technology programmes. Further, nearly three in four offshore students are enrolled on a full-time basis. In terms of country of origin, the following chart tracks student numbers for five countries with the largest enrolments in Australian higher education delivered offshore. DET cautions, however, that these figures reflect the location of the students during their studies and not necessarily their nationality. For example, as of 2016, about one quarter of students in Singapore enrolled in Australian TNE were third-country nationals. The five countries reflected in the chart accounted for just over 70% of all offshore enrolment in Australian higher education in 2016. And so the longer-term trends indicated there are interesting in that they describe a five-year trend of softening enrolment offshore among these leading markets (the exception being China which has shown steady growth over the period in question). From 2017 on, we might imagine that the coordinated efforts and action plans arising from Australia’s national strategy for international education may begin to bear on offshore enrolment numbers. It will be interesting to see how these longer-term trends develop, and if Australia’s offshore enrolment can establish a stronger growth trend that is more in line with the country’s substantial, continuing growth in onshore student numbers. This entry was posted in Australia, Australia/Oceania, Higher Education, Regions and tagged Australian higher education, student recruitment, transnational education, joint programmes, Offshore enrolment.